“Innovation, continuing research and listening closely to our customers’ needs…”. This is the opening line for the new Syncro video presenting their special Syncro transformation of the Volkswagen Crafter for the Swedish automotive company, Scania. The video shows a few minutes-long overview of the main features of conversion solutions carried out by the Syncro group in our centers all over the world. 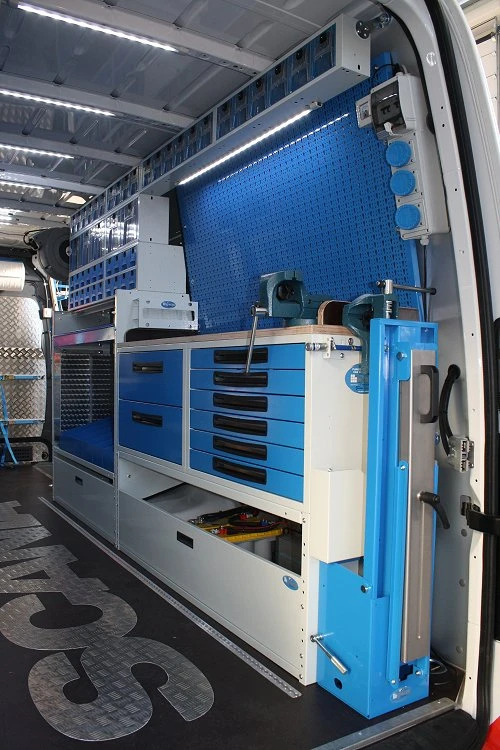 With made-to measure interior linings for each commercial vehicle model, innovative new products created to directly meet the needs of our clients, and tailor-designed conversions for each individual client. Customized interior protection:resin-coated plywood floor panel, protecting the original van flooring from everyday wear and tear, foot traffic, and dents and warping. The strip down the middle bears the Scania logo (precision laser cut) in chequered plate aluminum plating, reinforcing the already extremely strong floor panel. We also mounted protective chequered plate aluminum paneling on the doors and along the bulkhead. Modular racking solutions line both side walls – at the bottom, we installed wheel arch base frames equipped with opening front panels for convenient storage. Above them, a combination of our basic racking components with shelving and drawer units and a locker with double front doors. To make the most of the cargo space, we used our new innovative, patented rotational hinge door panels– that fully opens, making it easy to slide the plastic containers in and out without hitting edges and without taking up extra space. 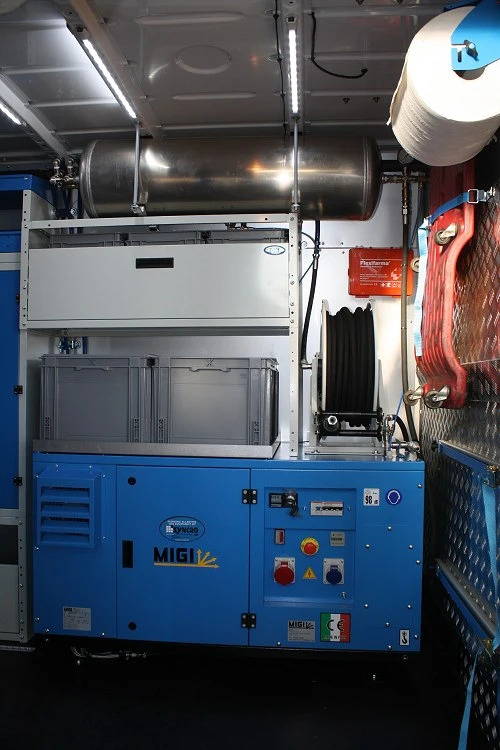 A powerful, yet compact and silent, combo generator-compressor was mounted on the left-hand side wall near the bulkhead. 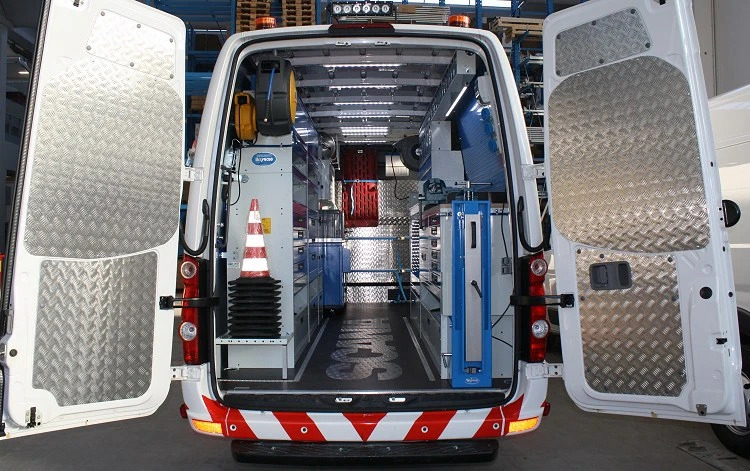 Together with the compressed air tank, this allows the van total autonomy even along the roadside, or in other situations where there is no external source of electricity. On the right-hand side wall, we created a fully functional work space with a durable wooden worktop, vise, and convenient tool wall organizer. 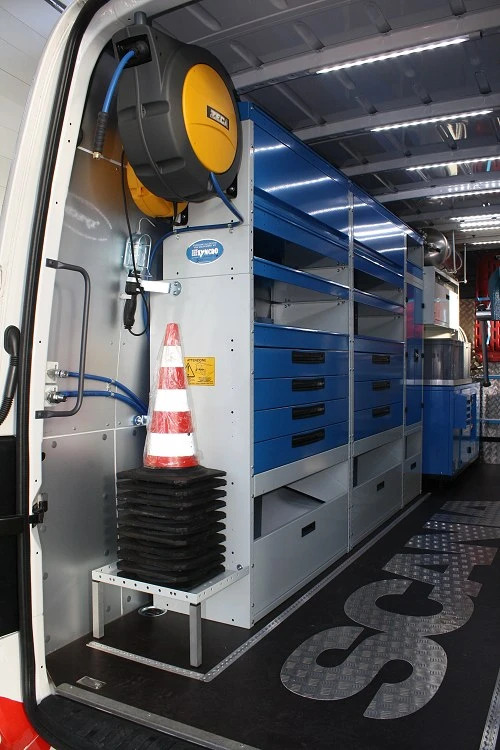 Plus, lots and lots of storage space for small parts and tools, thanks to the 48 clear plastic drawers – which can be subdivided, using the provided Syncro System aluminum dividers. We fixed a folding loading ramp along the bulkhead, thanks to a system of straps and clasps. 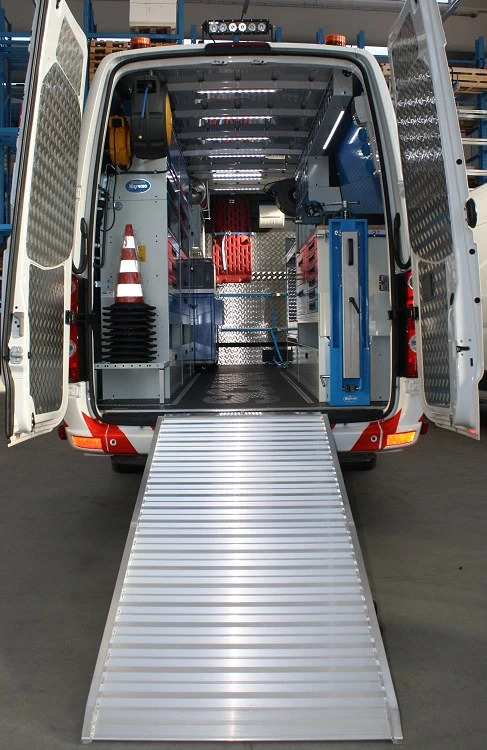 For loading and unloading heavy cargo, a workman-durable ramp gives you maximum benefit for the small amount of storage space it takes up on the van. Due to the placement of inlaid tracks in the flooring, straps and clasps can be easily used in various positions – depending on what kind of cargo needs to be tied down. A few essential accessories finish off the transformation: the hanging cable holder, the hand-washing kit, electrical sockets for recharging the forklift, cord reel, light, external flashing beacon, and a series of LED ceiling lights.